It's hard to talk about Karen Joy Fowler's We Are All Completely Beside Ourselves without giving away a major plot twist, though I would say that the plot twist is given away in many reviews, so maybe it is not really a twist. I hadn't really heard anything about this book until it showed up on so many people's Best of 2014 lists. It's narrated by Rosemary, a hilarious and likable woman looking back on her childhood and her college years. Rosemary had an unusual upbringing; her father was a psychologist and her mother a scientist, and there were many experiments performed on Rosemary and her siblings, Fern and Lowell, throughout their childhood. But one day, Fern disappears, and then Lowell leaves, too, and Rosemary spends the rest of her life trying to put her family back together again. I did the audiobook for Fowler's novel and loved the narrator. She really captured the dry sense of humor that pervades the whole book. While I don't think this book will end up on my best of 2015 list, I really enjoyed its quirky sense of humor and the way Fowler makes clear that our actions have consequences that can echo down for years and years. This book did remind me a bit of Ruth Ozeki's My Year of Meats in that there are portions of it that are tough to swallow. If you are an animal rights activist, be warned. That said, if you are an animal rights activist, I think you would really get a lot from this book. 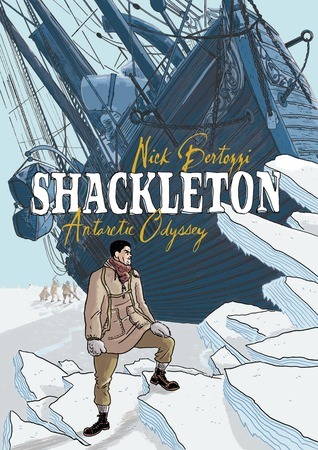 I picked up Nick Bertozzi's Shackleton: Antarctic Odyssey on a whim at the library and read it that night as I needed a break from A Brief History of Seven Killings (more on that book when I finish it). I find the whole era of Arctic and Antarctic exploration completely fascinating, and was excited to read about Shackleton's ill-fated trip to the South Pole in graphic novel format. But a lot of things happened to Shackleton over a very long period of time, and I don't think a slim graphic novel is the best way to share the story. This felt quite choppy and there wasn't much narrative flow. There also wasn't a lot of explanation of what certain terms meant or why some decisions were made, which was disappointing. I understand that one must condense, but here, it made me feel like a lot was missing. Particularly at the beginning, where years and years passed by in just a couple of pages and I was scrambling to figure out who the characters were. That said, Shackleton's story is pretty amazing, and it was fun to read about some of the things his crew did to keep themselves entertained through long, dark, and cold Antarctic winters. They played soccer, drank a lot of rum, held dogsled races, and joked around with each other. It was fun to read about these things but frustrating, too. I can't imagine the psychological toll that being stuck in Antarctica for a year would take on people, and the way Bertozzi describes it, almost everyone was perfectly content and happy the whole way through. I wanted way more depth. I have heard really good things about We Are All Completely Beside Ourselves but I am not sure if I would like it... I probably will try it at some point because I am curious. I think I will go the audio route if I do. I've heard so many great things about Fowler's book, but have yet to read it. I'm not sure why, since it does sounds rather interesting - considering the twist. Perhaps its time to dust off my copy and finally give it a read. Thanks! If you liked the message (or "having read") My Year of Meats, you might also like her later novel, All Over Creation. This is a cool idea for a post! I have We Are All Completely Beside Ourselves hanging out on my nightstand, and I'm nervous about it. Ain't gonna lie! Tough to swallow how? Like it felt implausible, or like it was too preachy, or...? I'm just curious -- I've been meaning to reread We Are All Completely Beside Ourselves, perhaps with a more jaundiced eye. I loved it the first time around, but I am willing to admit the possibility that I overlooked flaws. No, tough to swallow as in it can be pretty graphic and painful to read. I know a lot of people have difficulty with cruelty to animals, and I think parts of this book would be hard to get through, if taat is the case. Don't give yourself jaundice to read it again! I don't think the book had quite the effect on me that it had on many, many other people, but any time I feel that magic about a book, I never want it to go away! Keep it! the discussion here has made me curious to read this book. I will check it out. Regarding s We Are All Completely, have you notice that some covers give away the twist (www.literaryhoarders.com/wp-content/uploads/2014/07/US.jpg)? I've finish listening to it myself and I agree that the narrator does an amazing job. Wasn't so blown away by it as most people. At moments it felt almost preachy and during those moments I could help thinking of the books as just a long pamphlet. Lots of other books have agendas, they're just not so much in your face. Yes, I saw that cover, too! And I'm with you - I didn't love this book the way that other people loved it.